The recent release of the History Channel’s original mini-series The Hatfields and the McCoys has sparked renewed interested in this epic family feud, as well as other feuds in American history. But what makes this story so enduring? What is fact and what is legend? How does the Hatfield-McCoy saga fit into the context of its historical moment? – that is to say, does it tie into the larger context and history of the post-Civil War era or is it just an interesting story? But first, the facts. 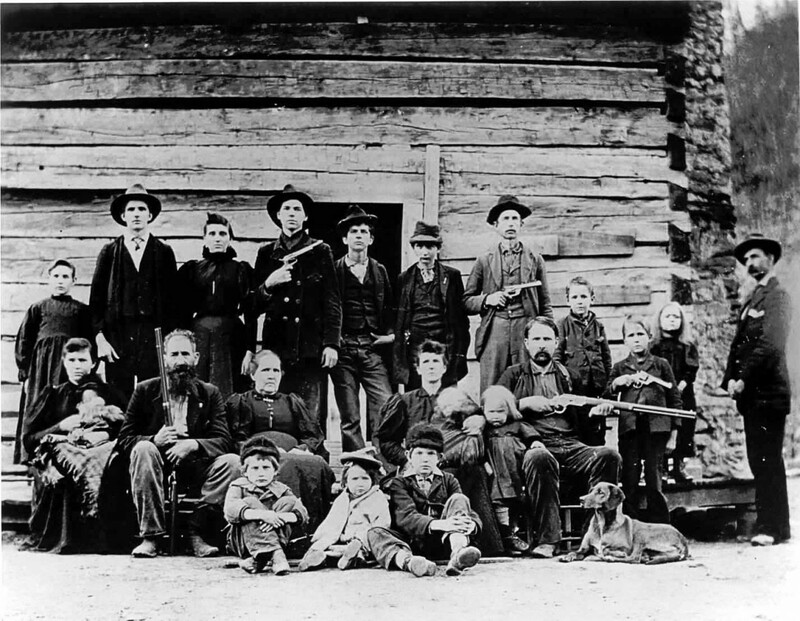 By the time of the Civil War and the beginning of the feud, both the Hatfield and McCoy families were long established in the Tug Valley, an area located on the border between West Virginia and Kentucky; most of the extended McCoy family lived in Kentucky while the Hatfields primarily resided in West Virginia. Each family was led by headstrong patriarchs, “Devil Anse” Hatfield and Randall McCoy. Although tensions existed prior to the Civil War, the first recorded outbreak of violence between the two families occurred in January of 1865, when returning Union soldier Asa Harmon McCoy was murdered. Members of each family had been active participants in the Civil War, primarily on the Confederate side, but Harmon McCoy opted instead to fight for Union forces, much to the dismay of many members of his own family. Devil Anse, on the other hand, was a strong Southern sympathizer, even leading a band of local guerrilla fighters known as the “Logan Wildcats.” When Harmon returned home from the war due to a broken leg, he received numerous threats from the Wildcats. Heeding the warnings, he sought refugee in a nearby cave; despite receiving daily food and aid from his former slave, he was eventually discovered and murdered. Devil Anse, infirm at the time of the murder, was never charged with anything. No one was. Other incidents later followed. In 1878, the Hatfields and McCoys went to the justice of the peace over a debate about a pig; the Hatfields believed it belonged to them since it was on their land, while the McCoys claimed original ownership. The matter was settled when Bill Staton, who was related to both families, gave testimony favoring the Hatfields, who later won the case. Staton, however, wasn’t so lucky; two years later, he would be killed by Sam and Paris McCoy, who claimed self-defense in the matter. Around the same time, a McCoy daughter named Roseanna became involved with Devil Anse’s son, Johnson, even living with him for a time. She became pregnant, but returned to her family, abandoned by Johnson, who would go on to marry her cousin just a few months later. After the Roseanne-Johnson debacle, tensions between the families reached new, more violent heights. Ellison Hatfield was killed by three of Roseanna’s brothers, who brutally stabbed him 26 times. Devil Anse & Co. returned the favor, viciously shooting the three after Ellison passed away. The violence culminated in 1888 with the so-called “New Years Night Massacre,” when several members of the Hatfield family drove McCoy families from their homes with fire and attacked those who fled. At this time, given state-border issues, the U.S. Supreme Court became involved in what had been a local issue. Newspapers across the nation were splashed with lurid details about the matter and people were transfixed by the feud. Eight men were eventually brought to trial in Kentucky and convicted; seven received life sentences, while Ellison Mounts was sentenced to hang. Thousands attended the hanging. In 1891, the families unofficially agree to stop fighting and many members moved away. Although a morbidly interesting story, what does that Hatfield-McCoy tell us about the time period? And why, over a hundred years later, are people still so fascinated? At least some of our answers can be traced back to the age-old struggle between “progress” and “tradition.” Kinship ties have long been the most important bond in many cultures globally and historically, and the McCoys and Hatfields were no exception. But these ideals of loyalty, honor and family were (and are) constantly under assault by the problems of modern reality. As Martha Hode’s book The Sea Captain’s Wife documents, Civil War loyalties did not fall strictly along the Mason-Dixon lines. Business, family, and political ties all played a dynamic role in determining one’s allegiances – sometimes with tragic results, as in the case of Asa McCoy. Further, as a result of the Second Industrial Revolution, there were new opportunities for wealth development, as well as new opportunities for disparity. Devil Anse made a healthy sum from his timbering operation (he even hired some McCoys), but his counterpart Randall McCoy was far less affluent and well-connected. With the explosion of the popular press, the McCoy-Hatfield feud was ripe to become sensational fodder for a national audience. View a History channel special providing background on the feud. Selections of Blood Feud: The Hatfields and the McCoys: The Epic Story of Murder and Vengeance can be read on google books. Members of the Hatfields and McCoys officially ended the feud on the CBS Early Show in 2003, but it’s safe to say that the score was already settled in 1979, when the two families appeared together on “Family Feud.” The winners got a pig. Special thank you to Derek Bredeson for consulting on this article.